The time is nearly upon us again when athletes from around the world converge under the banner of the Olympic games for the opportunity to create a legacy and represent their country in one of the most traditional ways possible. The Paris 1900 games were one of the most significant of all time, as they were the first to have females compete. While women in these games could only take part in lawn tennis or golf, it was the beginning of an immensely crucial period for women’s sports. From those 1900 Olympics, women’s involvement has only grown and grown, with athletics and gymnastics finally debuting in 1928. Even as recently as 2012 further milestones have been achieved with these being the first games to include women’s boxing and have every competing nation be represented by a woman. 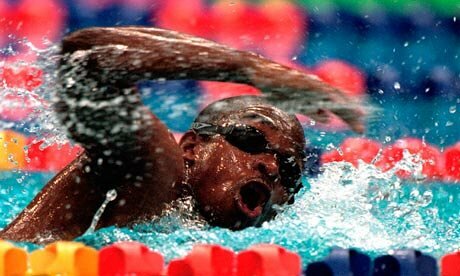 Eric ‘The Eel’ Moussambani had never seen an Olympic pool until he competed in the 2000 summer games, a chance that was given to him through the wildcard for developing countries. He won his heat as the other swimmers were disqualified, but his time of 1:52.72 meant he could not progress in the competition. Ordinarily such a time would be an embarrassment but with the circumstances surrounding Moussambani, (he’d only taken up swimming 8 months prior to the games!) the whole world rallied behind his unbreakable spirit and upon finishing his solo race, was greeted with rapturous applause. Please click on the image to see the amazing story unfold. It’s probably not a good omen if you’re heading to your 6th Olympic games, you’re a diabetic who’s recovering from colitis and a broken arm, and you’re 38 years old… Unfortunately, no one mentioned this omen to Steve Redgrave, one of our greatest Olympians of all time. At the 2000 games in Sydney, a crowd dominated by British supporters cheered on Redgrave, Cracknell, Pinsent and Foster through a nail-biting, epic ordeal and witnessed Redgrave capture his fifth consecutive gold medal. Such a feat has only been accomplished by Redgrave in endurance sports, and cemented him in the history books forever. The camaraderie and passion of the team captured the hearts of fans around the world, and you can see why in the video above. Sometimes in life it feels like you’re just not meant to win, that you’re always going to be a lesser version of the self that you work so hard to be. And in the realm of sport, there may never have been a harsher example of this than the Olympic dreams of Kelly Holmes. The 2004 Athens Olympics were the goal, but a 2003 that plagued Holmes with injuries lead her to a deep depression that threatened to take everything from her. She later admitted thoughts of taking her own life at this point. However, upon seeking professional help and being diagnosed with clinical depression, Holmes began her recovery. With the aid of serotonin tablets, Kelly was able to get back into winning form and was confident in being injury-free and healthy once again. When she did arrive in Athens, it was only announced five days before the events that Holmes planned to compete in both the 800m and 1500m races. Then, in two thrilling victories that had people across Britain tearing up with pride, Kelly became only the third woman to win both events. Her two gold medals have since lead her to establish her own charity, become a national celebrity and be honoured with a DBE. At the 1936 games, in Germany of all places, it was still very much a thought that a black athlete would automatically be inferior to a white athlete due to the colour of their skin. But then came along Jesse Owens, a charming and modest athlete from Oakville, Alabama… Who just also happened to be black. Owens won gold in each of the four events he competed in, the 100m, 200m, 4×100 relay and long jump. In one summer, Owens broke down barriers and shattered stereotypes for all athletes around the world and became a cultural icon in his home country. And while, sadly, we still live in a world where discrimination and blind hatred exist, Jesse Owens did more in one Olympic games than many could hope to do in a lifetime. At the 1992 games, British athlete, Derek Redmond was a favourite to stand on the podium in the 400m. However, disaster struck when Redmond’s hamstring tore halfway through the semi-final, sending him crumbling down to one knee. But as staff checked on him, Redmond suddenly shot up again, limping as fast as he could toward the finish line. Unable to see his son in such pain, Redmond’s father came to his aid. Shooing away security and officials, Derek’s father held his distraught son as the pair crossed the finish line together in an unforgettable moment of heartbreak, victory and love. At the 2008 Beijing games, Michael Phelps snatched Mark Spitz’s record of most wins at a single games and at the 2012 London games, became the most decorated Olympian of all time. The Baltimore native stunned the world by capturing 22 medals over a period of three Olympiads, his most successful being Beijing, where he won gold eight times. While 2012 was said to be Phelps’ final games, he announced his return in 2014 and plans to complete in the 2016 games. Clearly the sky is still the limit for Phelps’ golden record. In 1968, the world was still rife with social injustice, apartheid was a huge concern for many black athletes and nations threatened a boycott of the games if South Africa were included. The International Olympic Committee eventually decided against including South Africa. During these games, in a display of solidarity and pride, Tommie Smith and John Carlos, the men’s 200m winner and bronze medallist, stood on the podium and raised their black-gloved fists in the ‘Black Power’ salute. The Americans’ salute was in support of the Black Freedom Movement in their country, as well as the Olympic Project for Human Rights. Silver medallist, Peter Norman, also wore an Olympic Project for Human Rights badge to show his allegiance to the pair. Due to the political motivations of their actions, Smith and Carlos were immediately suspended from the US team and removed from the Olympic village. Norman on the other hand quit athletics after Australia chose not to take a men’s sprinting team to the 1972 games. While the trio’s athletic achievements were great, it is their boldness in the face of discrimination that will be remembered forever. Bringing tears to the eyes of a crowd of thousands of people is a near impossible task, however, if the impossible is asked, there is one man that could always deliver. In 1996, the USA hosted the Olympics in Atlanta and all eyes were on the opening ceremony with the US bringing pomp and pageantry like only they can. After a ceremony filled with cheerleaders, butterflies and even Zeus himself, the Olympic torch finally found its way to the top of the staging area for the final guest to light the flame. The final participant had been kept a surprise and many had speculated which former Olympian would close the show, but no one expected the sudden appearance of the legendary, Muhammad Ali. His body, long riddled with Parkinson’s disease, shook as his torch ignited and millions worldwide froze to see whether he had the control to light the final flame. The crowd of thousands roared as Ali accomplished his mission, and at the sight of such a moment no one could deny that there was not a single dry eye in the house. Now if some of those moments don’t inspire you to do something great today, I don’t know what will. One thing is for sure though, controversy or no controversy, the 2016 games in Rio de Janeiro promise to capture our hearts all over again. ← Your University Needs YOU!